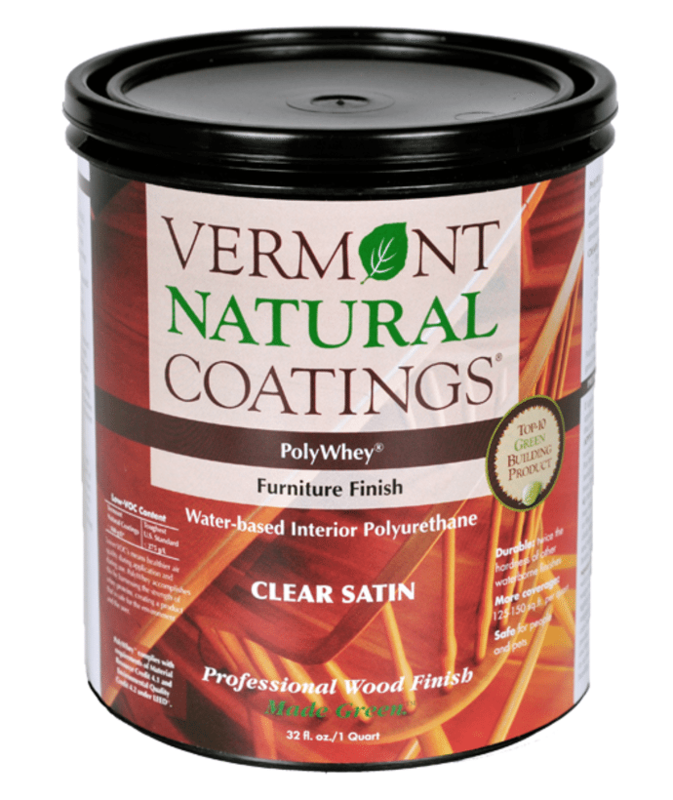 If you haven’t heard of Vermont Natural Coatings, this will sound kind of crazy. This small company located about 40 minutes from our Topcoat shop makes water based finishes that are fortified with whey – the protein that is a by-product of cheese making. Replacing Toxic Chems with Cheese? No Way! Way. PolyWhey™. And its really good. We say this as previous users of oil based clears for decades. You remember, the kind that stunk, turned everything 80’s yellow/gold, and required special brushes and cleaning. In around ’07, we switched to ZAR Ultramax. And then a couple years later we replaced that with SW Wood Classics. There are surprisingly few options in the category of interior clear wood finishes from the major manufacturers. It is a small market segment, so they don’t invest as much into R&D for it. The category was wide open for the finish equivalent of a smart microbrewery to make something good. 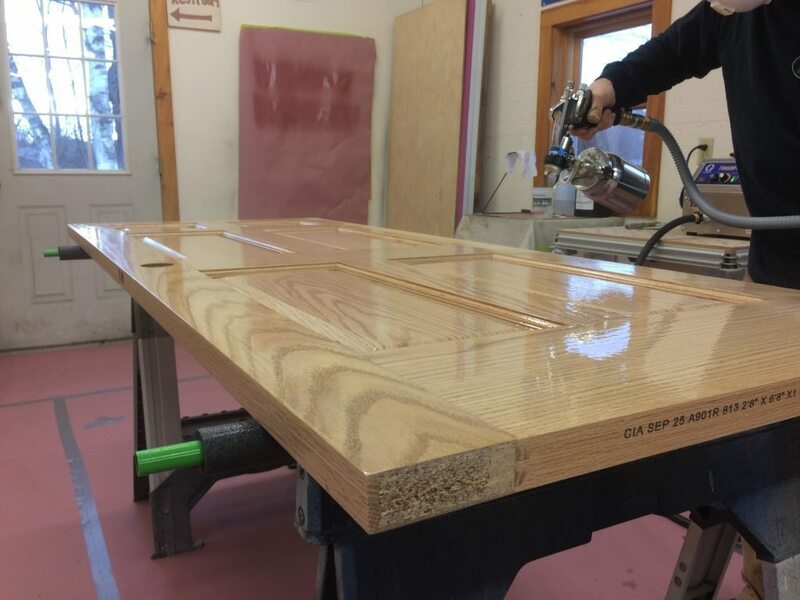 Vermont Natural Coatings has quietly turned environmentally sound clear finishes into not just a hipster pipe dream, but a desirable product in both user experience and quality of results. Applies great by spray or brush. We’ve used the whole VNC line in recent years, and have been particularly impressed with the satin and matte. The matte is sold as a floor finish, but is excellent on furniture and cabinetry. Clear matte finishes are hard to find. Vermont Natural Coatings are fast drying, low odor/VOC, and do not change the natural color of wood much – a rare and often desirable effect. Learn more about VNC Products. Hi Brian, thanks for writing. Generally, I don’t prefer to stain red mahogany because its natural tones are so pretty. It is possible to stain however. Finish-wise probably a 4 coat combo of Captains Gloss for two coats, then Epifanes Matte for two with light sanding between coats. Be sure to inspect annually and maintain as needed. Scott, These finishes are excellent on new wood. Has anyone ever used the clear product over an existing lacquer, polyurethane or varnish. Hi Larry, we have on small scale misc tasks here and there. Proceed as you would with any waterborne product…prep existing surface and test for compatibility in a less visible area. We have also used it with sanding sealer as a bridge coat. Nice, glad to see a write up on Vermont Natural Coatings! I’ve been using their products for eight years and they’re just getting better and better. Hey Nichole, yes I thought of you as I wrote this…I know you are way on board with the product line at Harmony Haus!